Born Sep 6 18681,8,13 [Sep - 18693,14, about 18709,10,11,15], Greensboro, Henry County, Indiana1,8,13. 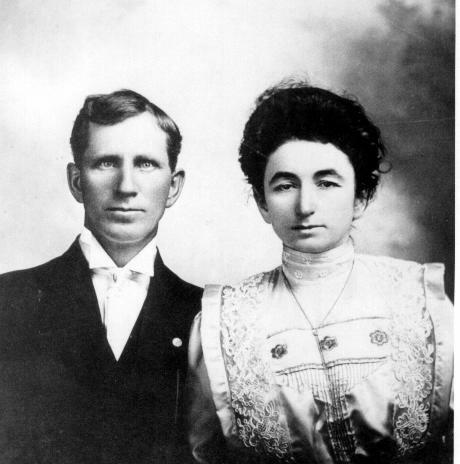 He married Kathryn Evelyn Lowrey1 [Katheryn Evelyn Lowery5], Dec 25 18891. Kathryn was born May 30 18711,3,4 [about 18736], Warren County, Illinois1,3,4. Hinshaw, B.W., head-of-household, age 30, born Sept 1869 in Indiana; father born in Ohio; mother born in Indiana; married 10 years; occupation: day laborer; rented home. 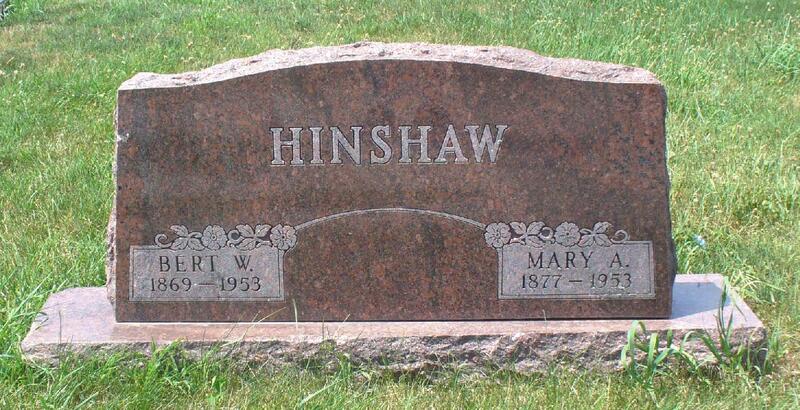 Hinshaw, Kate, wife, age 29, born May 1871 in Illinois; parents born in Ohio; married 10 years; 2 children, 2 living. Hinshaw, Guy, son, age 9, born Sept 1890 in Iowa; father born in Indiana; mother born in Illinois; attended school 9 months. Hinshaw, Fern, daughter, age 7, born Feb 1893 in Iowa; father born in Indiana; mother born in Illinois; attended school 9 months. Hinshaw, Katy, head-of-household, age 38, born in Illinois; father born in Ohio; mother born in Illinois; divorced; occupation: none; owned home (mortgaged). Hinshaw, Guy, son, age 19, born in Iowa; father born in Illinois [sic]; mother born in Indiana [sic]; occupation: carpenter. Hinshaw, Fern, daughter, age 18, born in Iowa; father born in Illinois [sic]; mother born in Indiana [sic]; attended school. Hinshaw, Ruth E., daughter, age 4, born in Washington; father born in Illinois [sic]; mother born in Indiana [sic]. Rex, James R., head-of-household, age 62, born in Michigan; parents born in New York; rented home; occupation: keeper, confection & p[..unclear..]. Rex, Katie, wife, age 47, born in Illinois; father born in Ohio; mother born in New York. Hinshaw, Ruth, daughter, age 14, born in Washington; father born in Indiana; mother born in Illinois; attended school. Turner, Oliver, head-of-household, age 26, born in Iowa; father born in Iowa; mother born in Indiana; first marriage, married 2 years; occupation: farmer; rented farm. Turner, Carrie, wife, age 26, born in Iowa; father born in New York; mother born in Indiana; first marriage, married 2 years; 1 child, 1 living. Turner, Gerald, son, age 0 months, born in Iowa; parents born in Iowa. Hinshaw, Bert, uncle, age 40, born in Indiana; parents born in Indiana; divorced; occupation: farm laborer. Franklin, Herman, head-of-household, age 49, born in Iowa; parents born in Ohio; single; owned home; occupation: farmer, general farm. Franklin, Sarah C., mother, age 69, born in Ohio; father born in Pennsylvania; mother born in Ohio; widow. Hinshaw, Bert W., brother-in-law, age 50, born in Indiana; father born in Ohio; mother born in Indiana; occupation: partner, general farm. Hinshaw, Mary A., sister, age 42, born in Iowa; parents born in Ohio. 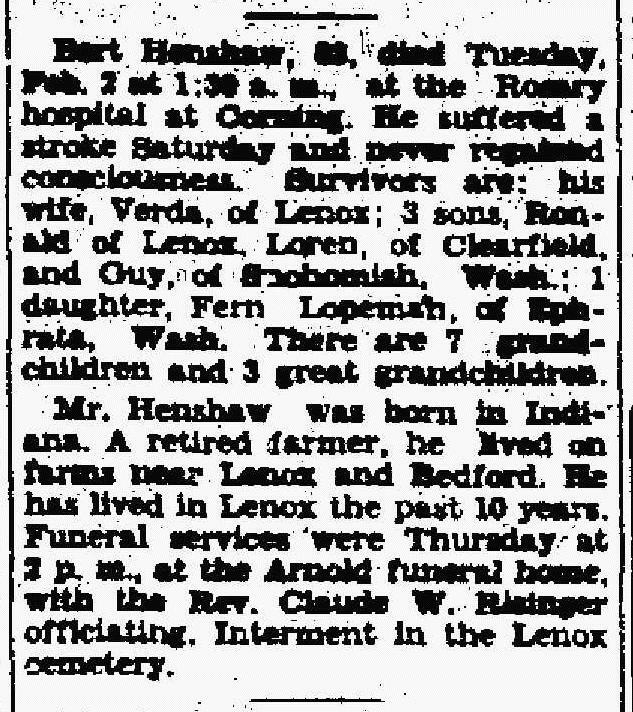 Hinshaw, Loren F., nephew, age 7, born in Iowa; father born in Indiana; mother born in Iowa; attended school. Hinshaw, Ronald G., nephew, age 4 years 8 months, born in Iowa; father born in Indiana; mother born in Iowa. Hinshaw, Bert W., head-of-household, age 55; born in Indiana; father: Hinshaw, Asel G, born in Ohio; mother: Wright, Mary J, born in Indiana; parents married in Indiana; affiliated with Methodist church. Hinshaw, Mary A., wife, age 46, born in Iowa; father: Franklin, Wm S, born in Ohio; mother: Rumble, Sarah C., born in Ohio; parents married in [..unclear..], Iowa; affiliated with Christian church. Hinshaw, Loren F., son, age 12, born in Iowa; father: Hinshaw, Bert W., born in Indiana; mother: Franklin, Mary A., born in Iowa; parents married in Bedford, Iowa; attended school 9 months, achieved reader grade level 6. Hinshaw, Ronald G., son, age 9, born in Iowa; father: Hinshaw, Bert W., born in Indiana; mother: Franklin, Mary A., born in Iowa; parents married in Bedford, Iowa; attended school 9 months, achieved reader grade level 5. Hinshaw, Bert W., head-of-household, age 60, born in Indiana; father born in Ohio; mother born in Indiana; first married at age 21; owned home; radio in home; occupation: farmer, gen'l farming; not a veteran. Hinshaw, Mary A., wife, age 52, born in Iowa; parents born in Ohio; first married at age 33. Hinshaw, Loren, son, age 17, born in Iowa; father born in Indiana; mother born in Iowa; occupation: laborer, gen'l farming. Hinshaw, Ronald, son, age 15, born in Iowa; father born in Indiana; mother born in Iowa; attended school. Hinshaw, Bert W, head-of-household, age 70, born in Indiana; completed 8th grade; on Apr 1 1935 was living in the same place/town; owned farm ($2500 value); occupation: operator, farm. Hinshaw, Mary A, wife, age 62, born in Iowa; completed 8th grade; on Apr 1 1935 was living in the same place/town. Hinshaw, Loran F, son, age 27, born in Iowa; completed 4 years of high school; on Apr 1 1935 was living in the same place/town; occupation: partner, farm. Hinshaw, Ethel M, daughter-in-law, age 24, born in Iowa; completed 4 years of high school; on Apr 1 1935 was living in rural Adair County, Iowa. Hinshaw, Gary W, grandson, age 8 months, born in Iowa. Obituary of Bert Wright Hinshaw. 1900 census, Council Bluffs, Kane Township, Pottawattomie County, Iowa; roll T623-455, ED 141, page 16A, line #14, dwelling #294, family #307. 1910 census, Allen Precinct, Snohomish County, Washington; roll T624-1668, ED 266, page 22A, line #6, dwelling #2. 1920 census, Skykomish Precinct, Snohomish County, Washington; roll T625-1939, ED 176, page 6A, line #17, dwelling #8, family #8. 1920 census, Gay Township, Taylor County, Iowa; roll T625-514, ED 141, page 5A, line #1, dwelling #90, family #90. 1930 census, Platte Township, Taylor County, Iowa; roll T626-685, ED 22, page 1B, line #88, dwelling #22, family #22. 1940 census, Platte Township, Taylor County, Iowa; roll T627-1207, ED 87-23, page 6A, line #7, household #108. 1870 census, Millville P.O., Greensboro Township, Henry County, Indiana; roll M593-323, page 98, line #10, dwelling #284, family #298. 1910 census, Jackson Township, Taylor County, Iowa; roll T624-425, ED 135, page 109A, line #31, dwelling #94, family #94. "Adams County Free Press" (Corning, Iowa), Feb 12 1953; http://www.ancestry.com. 1925 Iowa state census, Grant Township, Taylor County, Iowa; http://www.ancestry.com. 1880 LDS census index, Gay Township, Taylor County, Iowa; roll T9-0366, page 163C. 1930 census, Bedford Township, Taylor County, Iowa; roll T626-685, ED 1, page 14B, line #68, dwelling #610, family #624. Photo courtesy of Cecil Hinshaw.